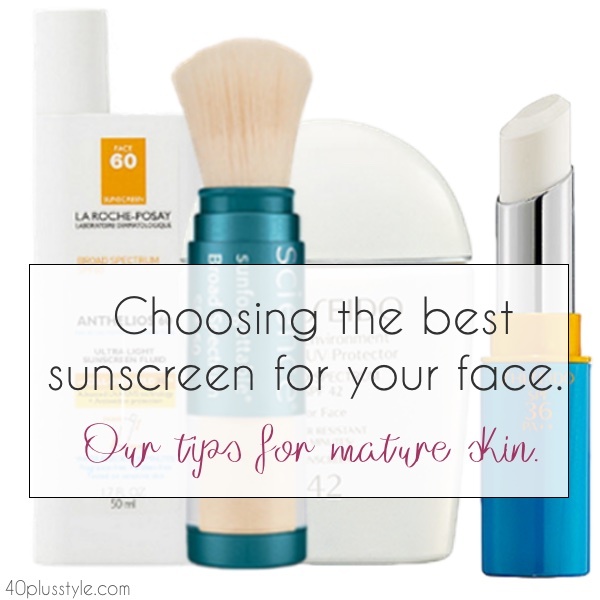 Choosing the best sunscreen for your face. If you live in the northern hemisphere, summertime is almost here. Time to be active outdoors and enjoy the longer, sunny days. And since you’ll be spending more time in the sun, it’s also time to think about how to select the best face sunscreen for mature skin. There’s so much information (and misinformation about sunscreen), we thought we’d put together a list of answers to many questions people have about sunscreen. These tips will help you select the right sunscreen for mature skin. Sunscreen protects your skin from photoaging. That’s all those wrinkles, mottled texture, and sun spots caused by sun exposure. And most importantly, sunscreen protects your skin from skin cancer. So protect your face every day because sun exposure is cumulative. Five minutes here, ten minutes there takes a toll on your skin. Make daily sunscreen a habit, like brushing your teeth. One of the easiest ways to get daily sunscreen coverage is in your makeup. Look for a makeup or tinted moisturizer that has an SPF of 15 or higher. It’s an easy way to make sure you’re always protected. I swear by It Cosmetics Your Skin but Better tinted CC cream. It has an SPF of 50, but still looks and feels light and sheer. 2. Even if you work indoors, you still need it. Think you don’t need sunscreen because you’re working indoors? Think again. Because although you’re indoors now, you probably walk outside to catch your bus, run errands, get the mail, or get in the car. Those few minutes add up to sun damage as the years tick by. I was shocked to learn that glass only blocks UVB rays, but UVA rays penetrate right through windows. And did you know that only the front windshields of cars are treated for UVA protection? The side windows and rear windows on cars aren’t treated for UVA rays. That’s why you might notice more freckles and sun exposure on the driver’s side of your face and hands. So wear sunscreen every day, and don’t forget to apply to your hands, arms, neck, and chest too, especially if you’re driving or riding in a car. Look for a sunscreen labeled “broad spectrum”. That means the sunscreen blocks out both UVA and UVB rays with an SPF of 30 or higher. That might sound simplistic, but if you don’t like the scent, texture, or something else about your sunscreen, you won’t apply it. And a sunscreen that’s left in the back of your medicine cabinet isn’t helping protect your skin. So try a few brands and types until you find one that you actually don’t mind applying. One of my favorites is the Sunforgettable brush on sunscreen with SPF50. I keep it in my purse and brush on my face, neck and even the back of my hands. It goes on invisible and the brush makes it easy to apply anywhere, even without a mirror. Yes, if you have a deeper complexion, you won’t show sun damage as quickly as someone who’s fairer complected but you are not immune to the damage and potential for skin cancer. In fact, skin cancer tends to be more deadly for darker skinned people. Don’t wait until you are outdoors to apply your sunscreen, apply at least 20 minutes before heading outside. A mineral, or physical, sunscreen uses ingredients like zinc oxide to sit on top of your skin and deflect the sun’s rays. A mineral sunscreen tends to be more gentle and won’t cause a breakout or allergic reaction. If you get red bumps or breakout after applying sunscreen, switch to a mineral sunscreen instead, especially on your face. Try Le Roche Posay’s Anthelios Sunscreen fluid. If you are going to be outdoors, one of the easiest ways to guard against sun damage is to cover up. 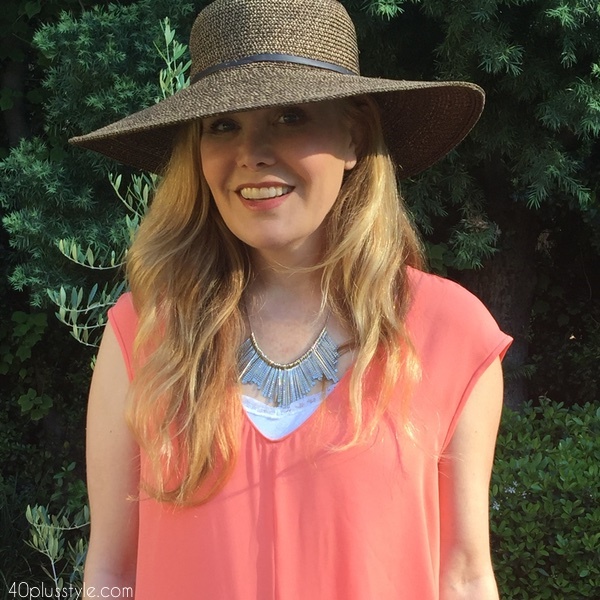 Wear a sunhat that covers your face, shoulders, and chest. The best way to not get sun damage is to not get any sun on your face in the first place. Choose a packable sun hat that you can fit in a purse, bag, or backpack in case you get caught outside in the sun, and stash one in the back of your car too. It’s never too late to take care of your skin! It Cosmetics Your Skin but Better tinted CC cream. sunforgettable brush on sunscreen with SPF50. What do you feel is the best sunscreen for your face? Give us your recommendations in the comments!